After our arrival in Istanbul, we found out that our flight had been cancelled because of the eruption of the volcano in Iceland. We were pretty frightened. We were standing in the queue waiting for the accommodation which we hoped could be offered to us by the company. 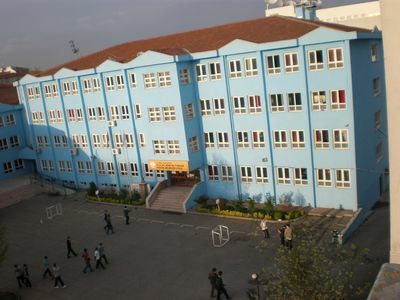 Our teachers were on the phone with the Turkish teacher Miss Fatime Havin Baran and also the headmaster Mr Abdullah Hasar. They tried to find us help in Istanbul from Diyarbakιr. After 5 hours a Turkish officer informed us they didn't have any accommodation. 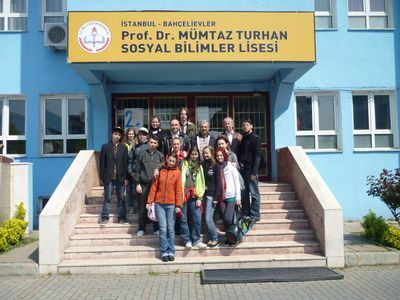 Fortunately, Mr Hasar found some help in the Ministry of Education in Istanbul and he asked some people there to find accommodation for us. After one hour Mr Adem Capkin came by bus and drove us to a boarding school. 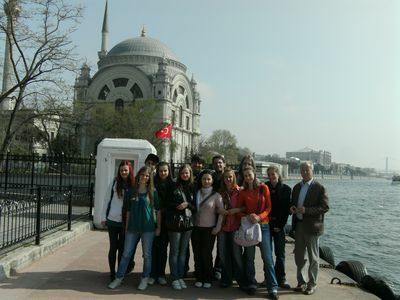 Mr Adem prepared the programme for us and took us on a sightseeing tour in Istanbul. Istanbul is a significant Turkish city. It is in the area of the Bosphorus strait. This isthmus connects and also separates two continents (Europe and Asia). The town is an important trade crossroads and the gate of the East. Istanbul is a busy city with a rich culture, nature and history. It was well known as Constantinople or Byzantium. The town was founded in the Antic period. At that time it was called Byzantium. Later, Istanbul became the metropolis of the Eastern-Roman Empire and was given the name of Constantinople. After conquering the Ottoman Empire, islam started to spread. The town developed successfully. A lot of important buildings were built. Since that time this town has been called Istanbul. We can find most of the historical monuments in the centre of Istanbul, in its European part. 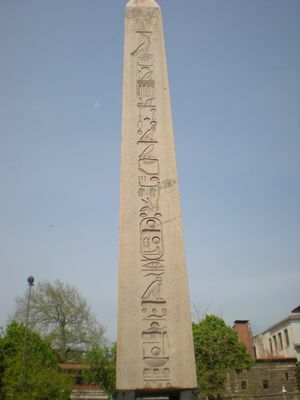 The oldest historical monument in town is the column of Constantine. It was built in the year 330 AD. The orb Constantine originally carried was said to contain a fragment of the True Cross (the cross upon which Jesus was crucified). Suleyman Mosque is a dominant part of town. The mosque has 4 minarets with 10 balconies. 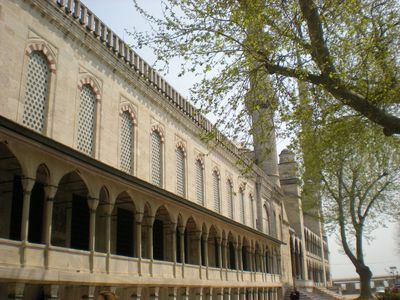 The mosque was built at the beginning of the 16th century.Dolmabahçe Palace stands on the shore of The Bosphorus. It became the residence of six sultans from 1855. It is a complex of palaces, mosques, fountains, pavilions, courtyards and seraglio. 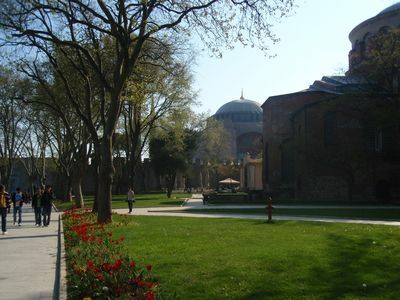 The most famous symbol of Istanbul is Haghia Sofia, temple of God's wisdom. Today it is a museum. 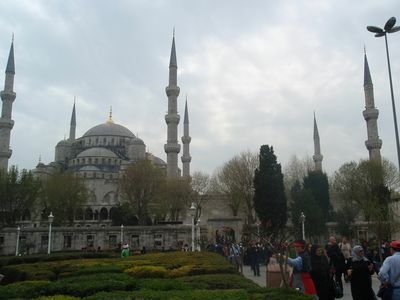 Opposite Haghia Sofia, the Blue Mosque, the second of Istanbul's symbols, is standing with its 6 minarets. The Mosque was built in the year 1617. 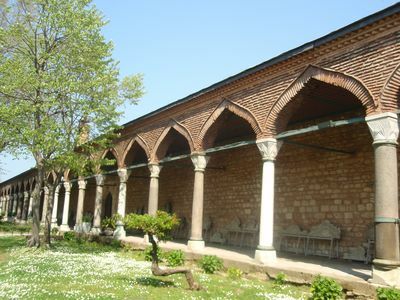 The most beautiful monument of Ottoman baroque style is the Tulip Mosque. You can also see the Archeological Museum with the collection of antique art. The most famous exhibit is the Statue of Alexander the Great. In the surroundings you can also find Topkapι Palace, Nuruosmaniye Mosque, Rüstem Pasha Mosque, Akvadukt Valens, Yavuz Selim Mosque, Pammakaristos Church, the Church of Saint Anthony of Padua... Another tourist attraction of Istanbul is the Egyptian Bazaar. We can find here a lot of stalls with a lot of goods. During your visit in Istanbul you shouldn't forget Turkish spas. In these spas you can refresh yourself and renew your energy. 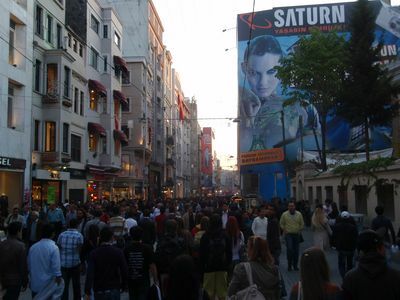 Nowadays, more than 12 million inhabitants live in Istanbul. Since 1985 the historical part of town has been listed in the List of UNESCO cultural heritage. 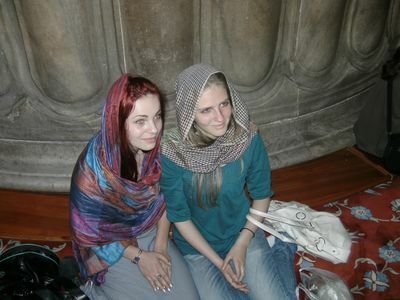 We were in Taksim square, at the Blue Mosque. 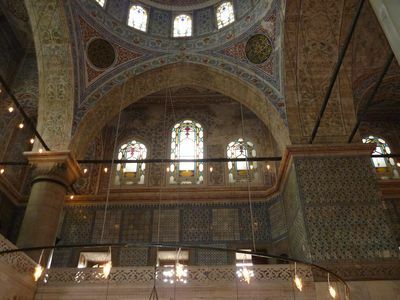 This "blue" mosque is together with Haghia Sophia the symbol of Istanbul. It is the biggest one in the city and the only one with 6 minarets. It was built by Ahmed I. (1603-1617) where the old Imperial Palace used to stand. The interior of the mosque is decorated with more than 20,000 beautiful bricks. The interior has an area of 51x53 metres and 260 colourful windows in five rows. Admission to the mosque is free. 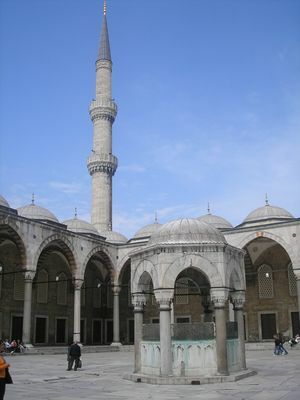 The Blue Mosque is the Mosque of Sultan Ahmed, who ruled from 1603 to 1617. The interesting places worth mentioning are the imperial Loge and the "mihrab" (indicating the direction of Mecca). You can visit the museum of carpets with the displaying different styles like Usak, Bergama and Konya, which were produced between the 16th and 19th century. The visitors can enter the courtyard through three gates which lead to the outer hall with columns of granite. On the roof there are almost 30 cupolas. In the middle there is a beautiful fountain. We saw the Bosphorus. In the afternoon our teachers went to the airport with Mr Adem and they came late in the evening and said: "We have good and bad news. We have rebooked our flight. The good news is - we are flying home. The bad news - we can't fly before Sunday." We were all surprised. We were disappointed, unhappy, it was unexpected. We expected our departure to be earlier. On the other hand, we were happy because it was a great chance for us to see Istanbul and be there longer and not to go to school for one more week. So we wrote e-mails home to our parents and waited for their reactions. On Tuesday the weather was not very good, so we stayed in the dormitory. We spent our time in a room where we had a workshop. We gathered photo materials, wrote a report about our stay in Turkey and tried to finish things which we weren't able to do in Diyarbakιr because of lack of time. We were allowed to observe lessons in the local secondary school. There were classes which were preparing for the programme IB. So we joined them. We introduced ourselves, said where we come from and gave some information about Slovakia. In the afternoon we went for a walk in the shopping street near our dormitory. In the morning we had a presentation of our country in the school theatre hall. It was a short version of our programme in Diyarbakιr. After the presentation we were invited by the headmaster of the school for lunch at a restaurant with a beautiful view on the Bosphorus. 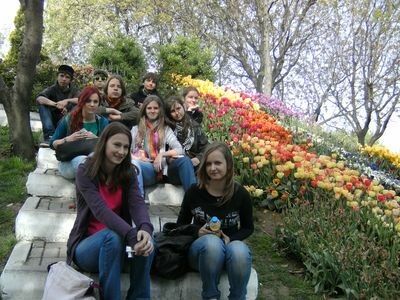 After lunch we went to see Topkapι Palace with some Turkish students. They were very polite, they informed us about exhibits, legends and many interesting things. There were exhibitions of the Sultan's clothes, dishes, jewellery and different tools. They were decorated with gold, silver and precious gems. We walked in the park, we saw buildings, where the parliament negotiated, the Sultan's bedroom and many other interesting historical things. All the rooms were decorated and we saw wonderful handmade drawings. In 1465 Mehmed II decided to build the royal complex. The whole complex was protected by strong walls. In the first courtyard the sultan's soldiers lived . There was also a mint and today there is an archeological museum and Fajans pavilion. The second courtyard is separated by the entrance gate Bab-üs Selam (the Gate of happiness). Ceremonies were held there and you could also find deer there. It was the garden of peace and quiet called Eden. All the people except for the Sultan had to go on foot there. In this part there was also a seraglio. It was a labyrinth of crossings, gardens and small courtyards, with about 300 different rooms. There were about 300 to 500 servants and personnel and sometimes 1,200 women. The seraglio was directed by the sultan's mother according to strict rules. Behind Bab-üs Saadet (the Gate of blessedness) the Sultan had delegations from the West. Ahmed's library can also there, as well as a nice pavilion from the 18th century with terraced gardens and cafés. 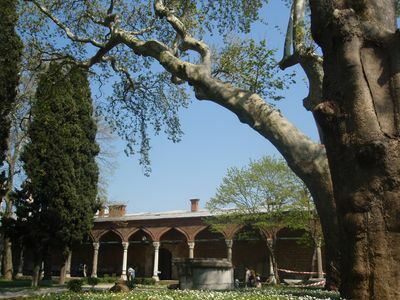 Topkapι Sarayi was a city in the city. Sometimes about 5,000 people lived there. This complex serves as a museum with the rich collections of different exhibits containing a huge collection of Chinese and Japanese porcelain, jewelleries and sultans' clothes. 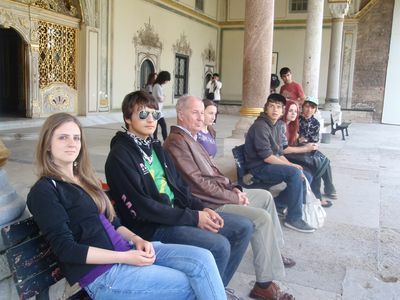 Three Turkish students who were with us in Topkapι offered us to arrange a trip for us. We went on a boat trip on the Bosphorus. 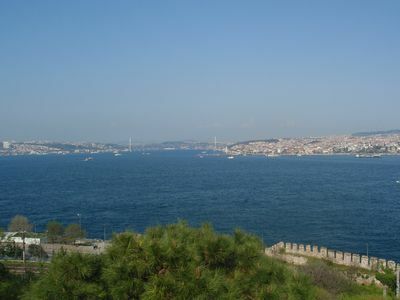 The Bosphorus strait, which still has a strategic importance, forms a connection between the Black Sea in the north and the Sea of Marmara in the south and also separates Europe from Asia. "Bosphorus" means "ox ford" or "ox passage" in Greek; the name comes from a Greek myth about Io's travels after Zeus turned her into an ox for her protection. Today, the strait is called "Istanbul Bogazi", or "Karadeniz Bogazi", or "Bogaziçi" in Turkish. The straits is 30 km long. 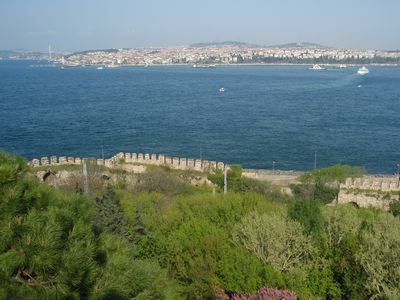 Dolmabahçe Saray ("the palace full of gardens") is located on the shore of the strait. In the coronation hall the biggest luster in the world which is nearly 4 tons heavy can be admired. In 1938, President Atatürk died in one of the Palace's small bedrooms. 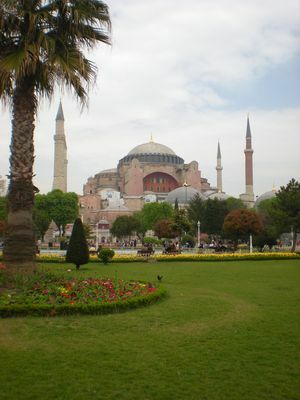 ... and Haghia Sophia Mosque. It is also called the Temple of God's wisdom. 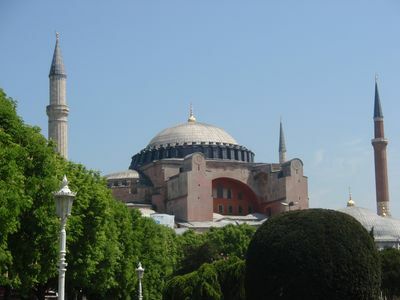 For more than one thousand years Haghia Sophia has been the most famous Christian temple in the world. It was built in 532 by the emperor Justinian. It has 40 windows. Its diameter is 33 metres and its height is 55.6 metres. There are 107 columns. The walls are made of marble and their colourful combinations (green, light green, yellow, light yellow, white-violet) form different pictures. It took 10, 000 men and 6 years to build it. It is one of the biggest religious buildings in the world. The head of a holy army - Enrico Dandolo, who burned the town in 1204, was buried here. Sultan Mehmed II had the temple changed into a mosque. He had 4 minarets, walls, wells, kitchen added. Five Turkish sultans were buried in its surroundings. It has served as a museum since 1934. We had lunch in a small cosy restaurant near the centre and went to the Egyptian Bazaar. We bought some souvenirs and went for a walk along Taksim square. We tasted Turkish ice-cream , Turkish sandwiches and American Cola as well. This square is the centre of modern Istanbul, where we notice a European way of life. On the left side there is the Memorial of Independence where the Russian square Istiklal Caddesi starts and square of entertainment Beyoglu finishes. 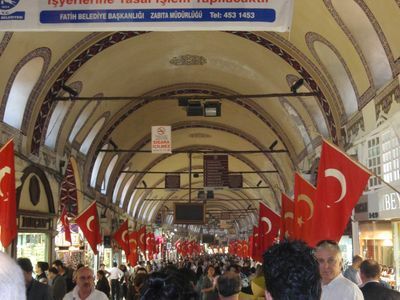 We enjoyed the 1.5 km long street full of shops, cinemas, markets and restaurants. We had wonderful time and experienced super atmosphere for our last evening in Istanbul centre. Saturday was the day we packed our suitcases. We packed our luggage very carefully. We cleaned our rooms, went for our last shopping. Then we had lunch. After dinner we met Turkish students who had accompanied us on Friday. We sat in a garden, had tea and talked about customs and traditions in both countries - Turkey and Slovakia. Since Morning we were excited because it was the day of our departure home from Turkey. We were a little bit sad . We had found some friends in the dormitory and it was not easy to say good-bye to them. Mr Adem came by bus and took us to the beach and to a beautiful park. A lot of people were walking and admiring the beautiful view. Then we went to the airport, Mr Adem wished us a safe journey home and finally, we boarded the plane. When we landed in Vienna, Mr and Mrs Mierka were waiting for us and we travelled home. At midnight, after a 5 hour's drive, we were happy to arrive home. Our parents hugged and kissed us as if we had been away from home for almost one year. We had hadmany new and unforgettable experiences from Turkey but we were happy to be at home again. In Slovakia we have a nice proverb: "Everywhere we have a good time, but at home we have the best time."